We are in the market for a new dining room rug. The one we had was an inexpensive rug that Matt had in his office years ago and was just supposed to be a temporary solution so that the chairs didn’t scratch the hardwood floors. Five years later, I’m finally getting around to finding a proper, more permanent solution. And when I say proper, I mean a higher-quality, more durable, and more tasteful solution. I have limited experience in the rug shopping area. Let me be even more honest – I have no idea what to look for. At our old house, Matt picked out his office rug based on design, our old dining room rug was a hand-me-down, and we had a custom-bound area rug made for our den. Look for a rug with a tight weave, which will be able to handle more foot traffic, and fairly long fibers. There are two tests for this. First look at the underside of the rug to make sure it is tightly woven. Second, run your fingers through the fibers to make sure they stay in place. Decide on fiber content, which will affect the durability of your rug. Even though it is more expensive than synthetic fibers, wool is the best fiber for high traffic areas because it rarely shows a worn path, holds its color well, and is naturally stain resistant. 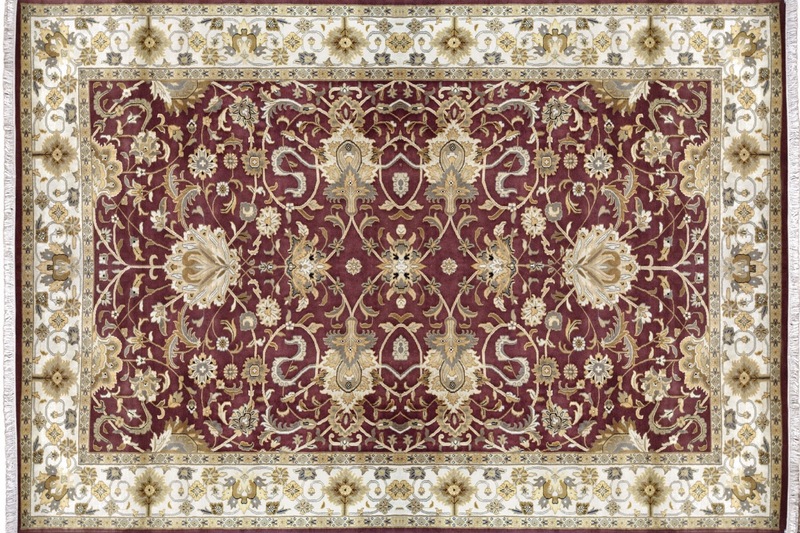 The stain resistant part is particularly appealing to me given that we will be placing this rug in the dining room. Greg isn’t discounting synthetic fibers, however. He suggests that they might be a great option for rooms with less traffic, like bedrooms. Check for color fastness. Given that it is going in the dining room – both a high traffic room in our house and the place where my 8 year old son will eat, I know regular rug cleanings will be needed. The last thing I want is to enjoy it for a year and then have it fade or bleed after one cleaning. Greg suggests testing it before purchasing by taking a white handkerchief along when shopping. When you find that perfect rug, dampen the cloth with hot water and rub it over a colorful place on the rug. If the color on the handkerchief is light, then the dye is strong. If the color on the handkerchief is dark, then there will most likely be color bleed into the lighter colored fibers. If you too are in the market for a new rug and have questions, call Greg at 336-804-0045 or e-mail him at acwcarpet@earthlink.net. He’s always happy to help. And don’t forget that A Cleaner World provides rug cleaning in Greensboro and the rest of the triad area for when you finally get that new rug and it needs its first cleaning. I’ll admit it. I complain – a lot – when I have mounds of laundry to do. It’s just so hard putting it in the washing machine, waiting an hour, putting it in the dryer, waiting another 30 minutes, folding it, and then finally putting it away. Seriously, other than pushing some buttons, bending over a little bit, and walking the clean clothes to the appropriate rooms, home laundry isn’t that hard of work. Before electricity, however, doing laundry was a back-breaking job. Ancient civilizations used to haul their clothes down to a local stream or river, beat them against rocks, dip them in the water a few times, and hand wring them to remove excess water. Oldandinteresting.com reports that ‘even in prosperous parts of the world – riverside washing went on well into the 19th century, or longer in rural areas.’ If you think about it, wash houses (buildings where water was routed in from a river or spring for doing laundry) could be considered luxurious at the time because at least you could stand up to work instead of being down on your hands and knees. Plus you also could do laundry even in inclement weather. Could you imagine trying to do your laundry in a frozen stream? The Industrial Revolution and the invention of the wringer washer helped transform the world of laundry. Even still, it’s not like they could throw it in a machine and go do something else. Perhaps it wasn’t as back-breaking, but it still required a chunk of time and some muscle. I still remember my grandmother’s wringer washer. Hers was electric – and considered state-of-the-art when she got it…..but perhaps not in 1976, when I remember her still using it. 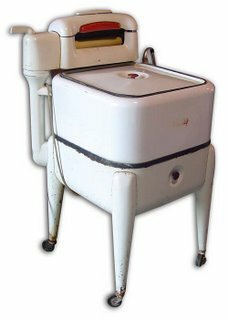 My first washing machine was a Cadillac compared to her wringer washer, though it seems bare-bones compared to the front-load, HE machine I have now. These days you can opt for a base model or buy one with all kinds of bells and whistles – cycle options, various sensors, steam, LCD displays, and even WI-FI. My how laundry has changed – from a stream to a tub of hot water and a washboard with a bar of soap to manual wringer washers and electric wringer washers to today. Goodness, today manufacturers have created washing machines that will all but iron and put the clothes away for you. Better than even that, you’ve got a family-owned dry cleaning operation right down the street that will not only clean your clothes but press them too. Then all you have to do is hang them in your closet. It’s funny how the season dictates our diet; summertime means lots of grilling at our house. It’s also funny how your taste buds change. Even just a few years ago, I wouldn’t have touched mustard. Now I love the stuff, especially the spicy Dijon version. 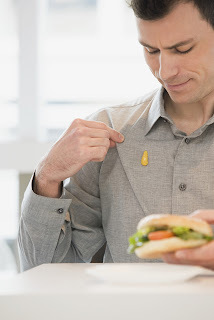 Did you know that mustard is among the single most difficult stains to remove? Traditional yellow mustard, with its mixture of mustard seed, color from turmeric, and liquid, is a combination stain. Throw in the Dijon version and that means it could also contain wine, and worst yet, Dijonnaise could contain both wine and mayonnaise. Determine how old the stain is and whether there were any prior stain removal attempts. Test the garment in an inconspicuous place to make sure there will be no dye bleeding. 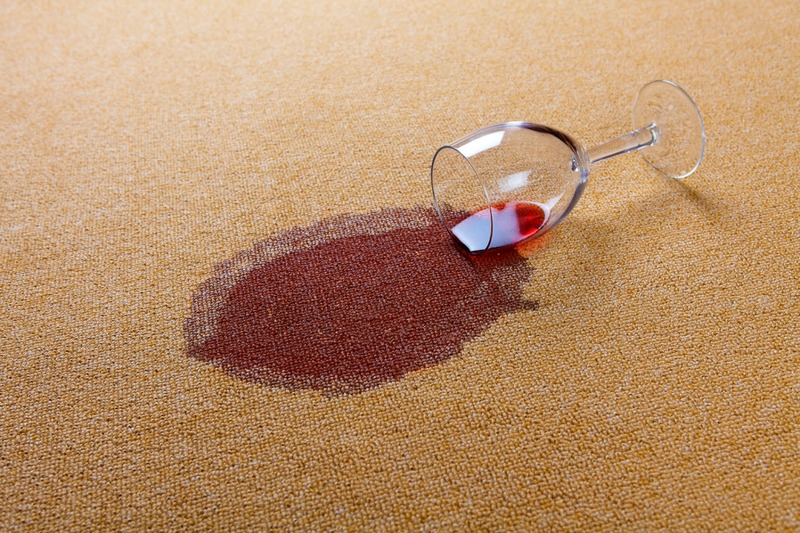 Begin the stain removal process by addressing each element individually, starting with the oil portion of the stain and moving on until each portion – vegetable, wine, dye – of the stain has been addressed. 1. I need to clarify my terminology just a bit. We (I mean everyone in general, but not Greg who understands the difference) use the words spot and stain interchangeably. A spot is a foreign matter that is usually removed by standard cleaning methods, while a stain is a foreign matter that has penetrated the rug’s fiber and possibly caused permanent damage. It is important to understand the difference when dealing with and discussing foreign matters on your rug. Which leads me to my second point. 2. Know when to quit. Sometimes it may take repeated attempts to completely remove a spot or spill. 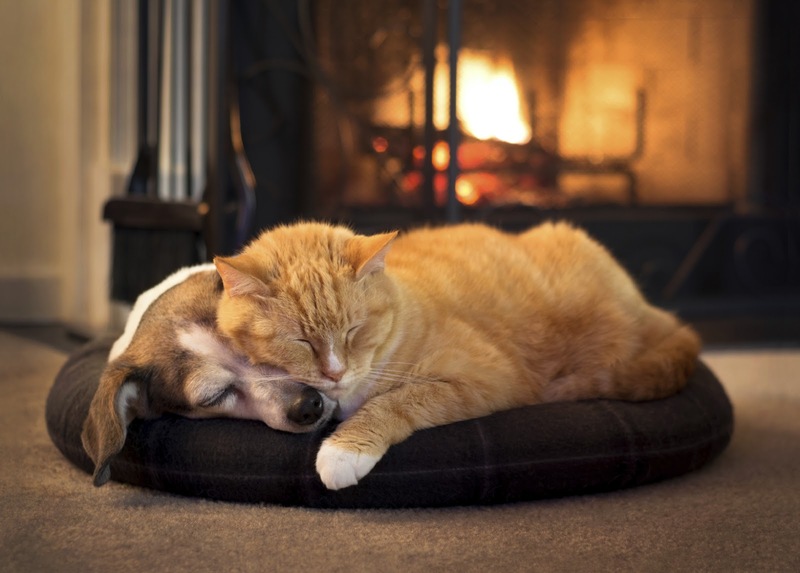 Likewise, there are times when some stains simply cannot be removed without causing permanent damage to the rug’s fiber. If you’ve made several unsuccessful attempts to remove a foreign matter, stop. Don’t take it too far. Once you’ve pulled color or damaged fibers, there’s no fixing it. Instead, call Greg at 336-804-0045, contact us through our web site, or e-mail Greg at acwcarpet@earthlink.net and let our professional rug cleaners have a go. So what happens to our tattered flags? 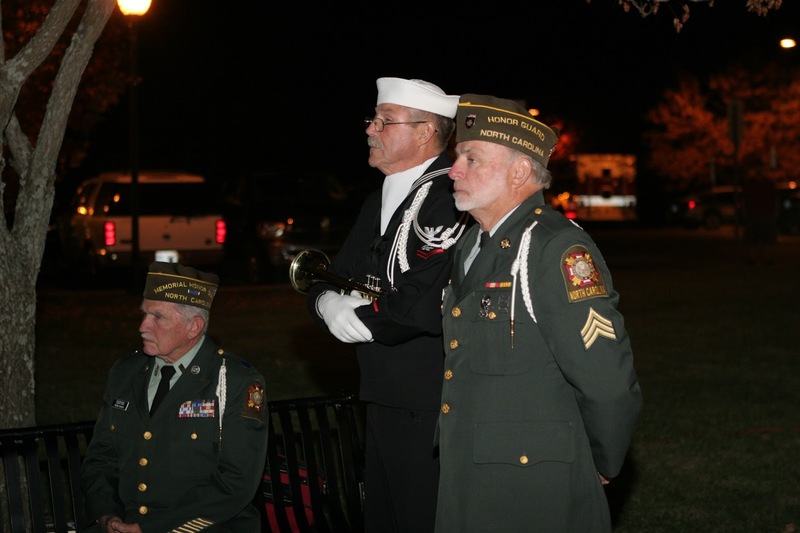 The Flag’s code doesn’t give any particular group the authority to retire unfit flags. It also doesn’t say that the only method in which to destroy a flag is by burning; burning is simply the preferred method. 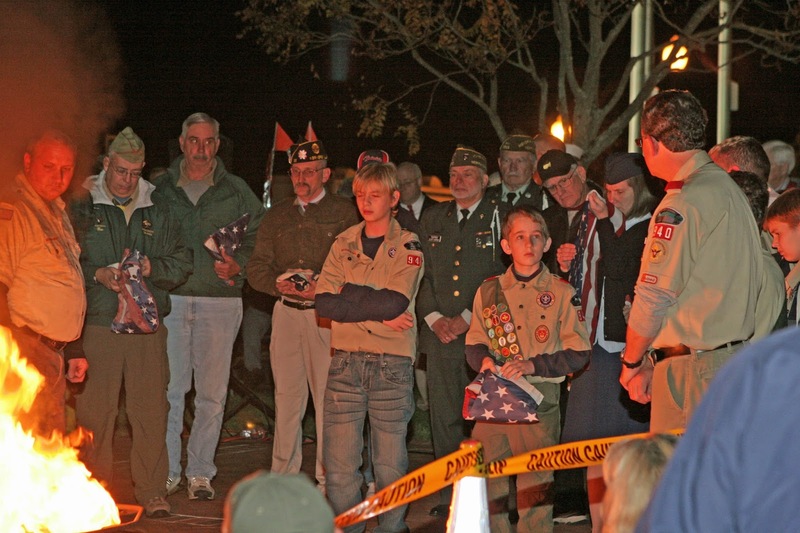 There are many terrific organizations like the VFW, Elks Lodge, and American Legion that accept tattered flags and perform retirement ceremonies, but the one we work with on this endeavor is the Boy Scouts. Have I ever mentioned that Chris is an Eagle Scout? It’s a title that he wears proudly and that really impresses my son. More on that second thing later. Chris is still involved with the Boy Scouts and periodically participates in Flag Retirement Ceremonies. 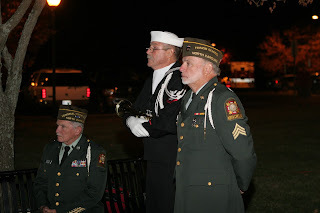 He was kind enough to share these photos from a Flag Retirement Ceremony done by his troop. So I’ve mentioned before that my son is a Cub Scout and absolutely loves it. 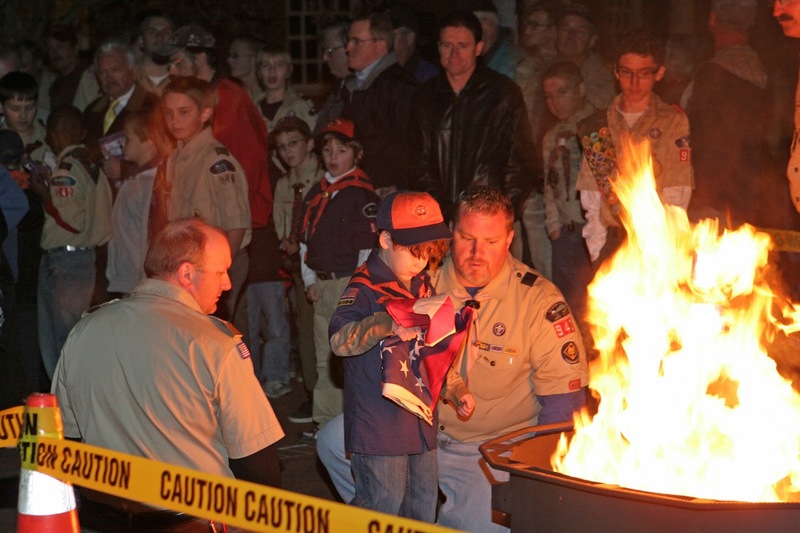 He takes Scouts very seriously; he insists that he too will someday be an Eagle Scout. 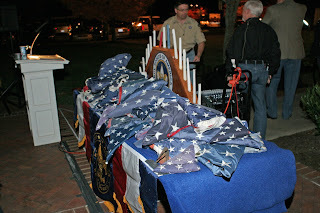 That’s why, when I found out that one of our locations had a flag that needed to be replaced, I called Chris to ask if Gray’s den could perform the retirement ceremony on the old flag. I’ll share photos from that ceremony down the road. But in the meantime, if you have flag that needs just needs a little cleaning, drop it off at any one of our locations. 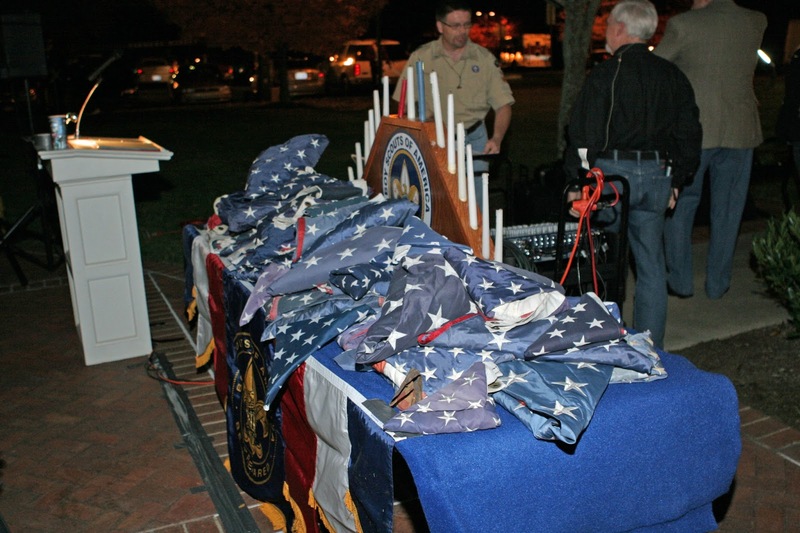 We clean American Flags for free – every day.